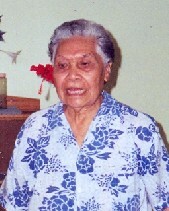 Sister Malia Senovefa (Etevise Toalepai) was born on the island of Manono, Samoa, on the 28th April 1916. She made first profession in the Missionary Sisters of the Society of Mary on the 12th September 1946 at Moamoa, Samoa. For the first ten years or more of her religious life, Sr Malia Senovefa, served taking care of the boarders, cooking and giving community service in most of our communities in Upolu and American Samoa. She was also one of the few privileged to be missioned to Tokelau, where she served for three years. In 1972 she went to Heretaunga, New Zealand to help bake and package the altar breads. She enjoyed very much this time in New Zealand and she picked up a lot of English. She returned to Samoa in 1976, where she once again took up the work of caring for boarders, sewing and cooking until 2002. At the age of 86, in 2002, she moved into our Maota Marista Rest Home at Vailoa, Samoa. It was here in this community, close to midday, on Wednesday 22 June that Sr Malia Senovefa slipped away quietly to where her heart had been longing, and to where her treasure – her Lord and God and Mother Mary were welcoming her home! Sisters M. Tolotea, M. Makalita, M. Emanuela and two of our care-givers were by her bedside praying and waiting with her. On the morning Sr Malia Senovefa died she had been at Mass and had received communion. Fr Patolo sm came and gave her the Anointing of the Sick about 40 minutes before she died. Sr Malia Senovefa was a very kind person who was always on the look-out to help and do good for others. She had a good sense of humour, could play with words and enjoyed her own jokes. One great quality she had was that she could ask for forgiveness. As she could be very independent it meant the early days at Maota Marista were confining. However she became more gentle and peaceful in her latter years. She was also very grateful and appreciative of all that was done for her in these years. Sisters who had lived with Sister Malia Senovefa recalled many fond memories of her fun-loving ways. They remembered her spirit of gratefulness, her simplicity and hidden Marist way of serving. They gave many examples of her genuine love for the people, her patience and perseverance through her many years as an smsm. With a smile they reminisced about how she would sing Iesu Le Suafa Lelei Lea and her favourite hymns to Mary. The Savalalo and Vaimoso teachers and Sisters sung at the Vigil Mass celebrated by Fr Lutoviko sm. The following day His Grace Archbishop Alapati Mateliga concelebrated with twelve priests of the archdiocese. The catechist students of the theological college led the choir for the celebration of thanksgiving for a life “joyfully given to God for the Kingdom in the spirit of Mary.” (SMSM Constitutions 23).